The screen specification of an Anilox roll is an important consideration as this will impact on the print quality. The objective is to use always the finest anilox screen count possible providing we can achieve the required colour densities. 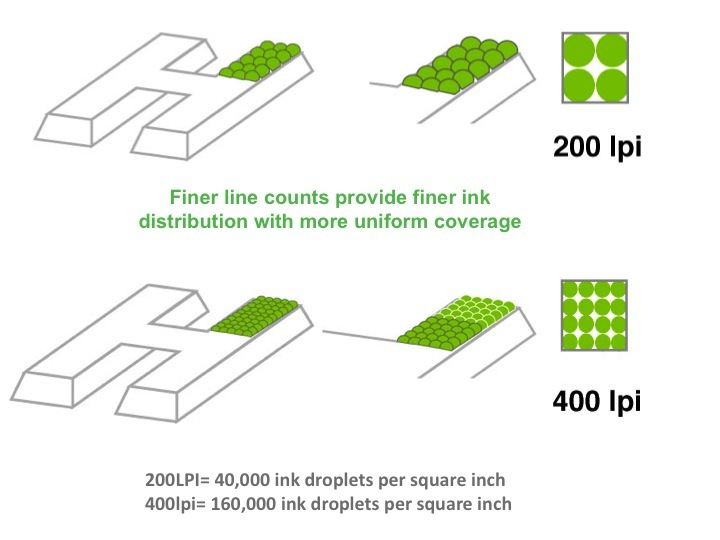 Higher line counts will provide a finer ink distribution, which will be critical when printing process. The line count determines the total number of ink dots that will be transferred to the plates. Higher line counts place more cells, closer together. 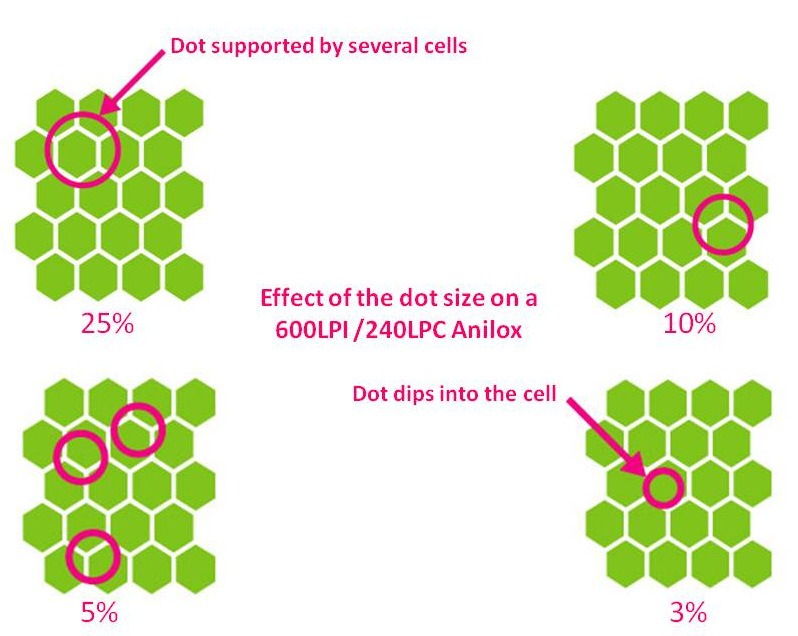 Smaller dots will dry faster producing less dot gain which will offer better image clarity in process jobs. When selecting a line count for a process job, the rule of thumb is to specify the line count as five times the plate screen. This ratio allows the cell walls to adequately support the dot and keeps the dot from dipping into the cells. Line count is chosen in correlation with cell volume, for example if forprinting solids a volume of 8cm3/m2 is required the line count will be approximately 400LPI. Please consult our volume chart to select the optimum volume for the chosen line count. The only downsize with fine line counts is the cell size is reduced becoming more challenging to deliver the adequate cell volume for achieving the correct colour densities. Today we can produce special engravings to offer high volumes at finer line counts such as our maxflo, masterflo and proflo engraving range. Please consult our Anilox versus plate screen table to help you select the best Anilox screen for a process job. The engraving angle is important because the placement of the cells determines the cell shape and more importantly, the orientation of the cell opening. When the cell opening is wider along the rotational axis, ink can flow out easier. When the cell opening is narrower along the rotation, there is less turbulence in the ink flow and less pin holing results in the print. The other important aspect of engraving angle is the efficiency of the cell placement. In a 45 degree pattern, which creates a diamond shape cell, there are more land areas.This takes up roll surface area that could otherwise be used for carrying ink. 60° and 30° angles place the cells in the tightest possible grouping which offers about 15% more cells per square inch of roll surface area at the same cell count than 45° engravings.This will offer a better and finer ink distribution.This means you can get the benefit of higher line counts and still maintain the same cell diameters simply by specifying a 30° or 60° degree engraving instead of a 45°. For example, a 600 LPI engraving at 60 degrees has approximately 414,000 cells / in2. If the same roll is specified at 45 degrees, it only has 360,000cells / in2, which is about the cell distribution of a 560 LPI roll. 60° angle engravings are the most used by printers as it offers the closest grouping of cells per square inch of roll surface compared to 45 ° and greater ink flow due to the fact the cell openings are wider at the rotational axis and the cells are positioned in a straight line along the rotational axis of the roller if compared to the 30° engraving. Choosing the best Anilox specification for any specific application will allow the printer to improve the quality of their product and create more innovative package designs. If you require further information please do not hesitate to contact our technical service department. 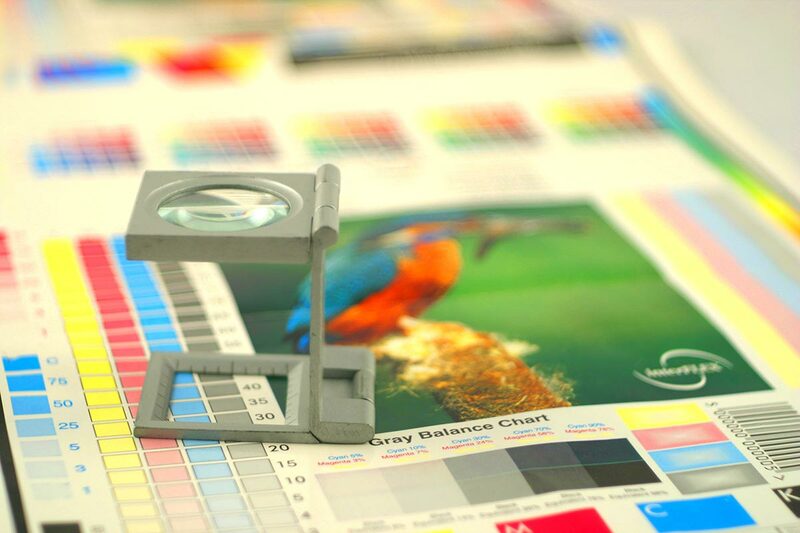 Understanding the impact of the Anilox screen parameters on the print job is crucial to improve print quality.